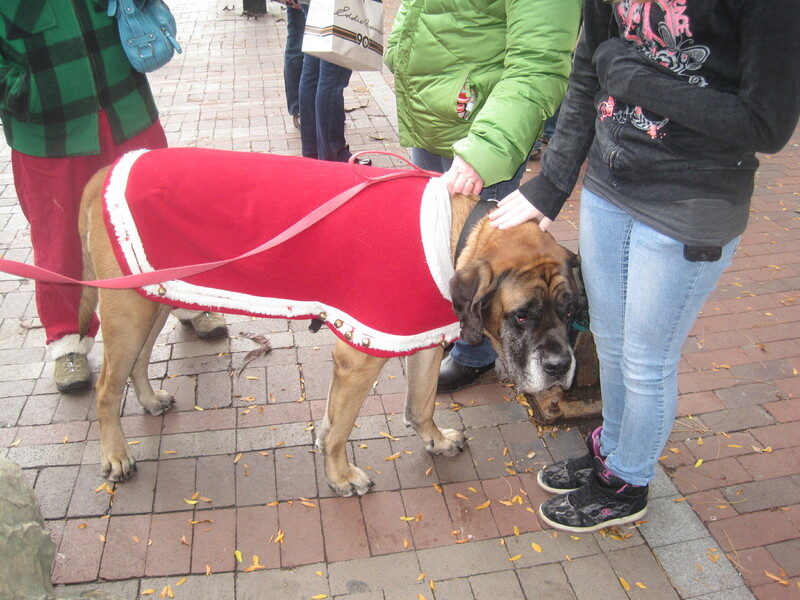 Brutus, a big English mastiff dog, was out among the hordes of shoppers on Burlington, Vermont’s Church Street Marketplace. Brutus, the English mastiff I met on Burlington, Vermont's Church Street Marketplace, already looks weary from holiday shopping. Resplendant in a red holiday coat, Brutus looked a little bored with the holiday hubub on Black Friday, but he took it all in as patiently as possible, all 175 pounds of him. Brutus’ companion, Roy Haines of Huntington, Vermont, said Brutus almost had a tragic end recently. He’d been well cared for over his seven year life until recently, when his owner went into a nursing home and could no longer look after Brutus. 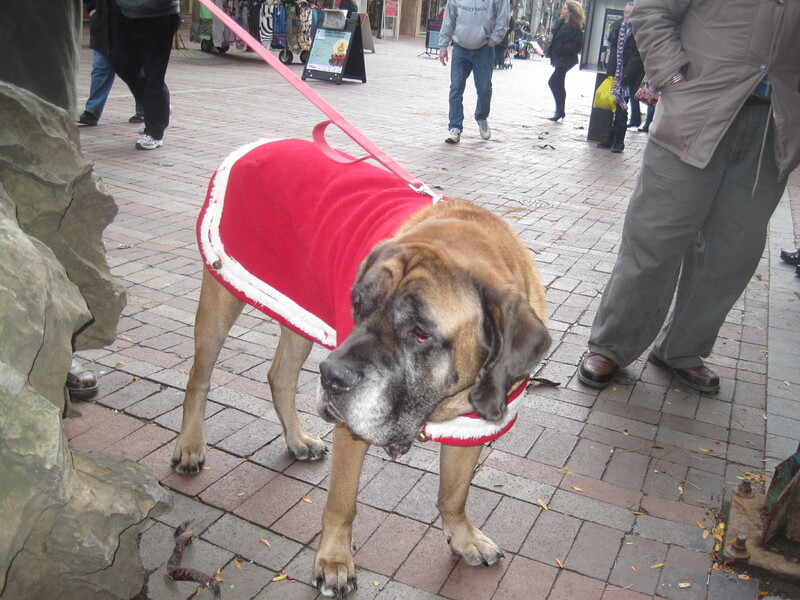 Brutus the English mastiff greets shoppers on Burlington, Vermont's Church Street Marketplace Friday. He was almost euthanized for want of adoption, Haines said, but a group called Save Our Strays went to bat for Brutus. They helped Haines adopt Brutus about six weeks ago. After a period of adjustment, the dog seems to be settling in just fine, Haines said. In any event, if you are interested in getting a pet, or helping others, consider adopting a pet from a reputable organization (Humane Society works great, too) or donate. Would be a nice Christmas gift to the furry ones out there. As Brutus demonstrates with his holiday finery, it’s the Christmas shopping season. He tells me to scratch giving a pet off your Christmas gift list, unless you are absolutely, positively sure the recipient wants it and will take good care of the animal. This entry was posted on November 27, 2010 at 12:44 pm and is filed under Uncategorized. You can follow any responses to this entry through the RSS 2.0 feed. You can leave a response, or trackback from your own site.